Despite its minute 1.0-litre three-cylinder engine, the Audi A3 Sedan, with its high-quality cabin and comfortable driveability, manages to punch above its weight. 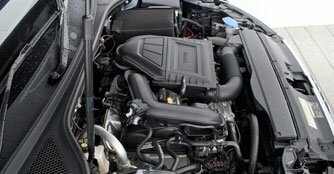 On paper, you wouldn't expect the 1.0-litre three-cylinder engine fitted to this car to be bubbly. In fact, with an engine this minute, it's hard to even imagine how well the car can fare on our expressways, especially when point-and-shoot manoeuvres are constantly needed to overtake road-hoggers on the first lane. But that's where you and I are wrong. We can't be wrong. Explain yourself! From the driver's seat, it's clear that the car isn't as rapid and powerful as its 1.4-litre brethren, but it's easy to see why this car is such a logical machine to drive, with its chirpy on-road character. 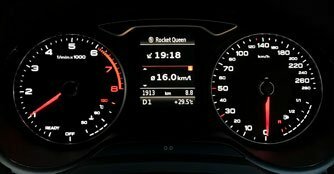 The single litre of displacement packs merely 116bhp, which may not sound like much but with 200Nm of torque, the Audi A3 Sedan holds no punches when it comes to moving about briskly, more so when you realise that all that meaty twisting force comes into play between 2,000rpm and 3,500rpm - a perfect bracket that's needed to tool along most cars in Singapore. While it is undoubtedly true that its straight-line acceleration is relaxing rather than rapid, you don't have to stretch the accelerator and strain the engine to keep up with the pack. Thanks to the quick-changing and accurate seven-speed S-tronic dual-clutch gearbox, any form of hesitation is eliminated when zipping in and out of traffic with the compact sedan. That said, the car doesn't come without its quibbles. For starters, the start-stop system is a tad gruff as it restarts slower with a more apparent tremble compared to its bigger capacity siblings. But as far as economy goes, the car understands that every drop counts. Driven hard, as we did during our time with the car, we managed 16km/L - far from the stated figure of 21.3km/L but nevertheless respectable for a 1.0-litre three-cylinder car that's capable of a 9.9-second century sprint. In comparison, the Volkswagen Jetta will finish the race just as quick, albeit with a bigger 1.4-litre four-pot engine. Where the A3 Sedan really counts is around town, where its refinement, unobtrusive and calming disposition shine like a diamond. The 1.0-litre powerplant, unlike the rather grumpy ones from the Ford Focus and the Opel Astra, is delightfully smooth and quiet. The very fact that the insulation is nothing less than admirable makes this car that much more relaxing and polite on the move. 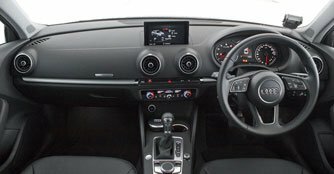 For an entry-level A3 that costs $135,400 (as of 20th March 2017), you would expect a cabin that's considerably bare. Not this car. Unlike before where bi-xenon headlamps were offered, the A3 Sedan now sports full LED head and taillights as standard. The car also comes equipped with Audi's Drive Select mode as well as an electric driver's seat. And even though an uncluttered cockpit, multi-function three-spoke steering and specific attention to details such as the quality clicks of buttons and controllers are expected from the brand bearing the four rings, it's always nice to know that you're getting so much more for the amount of money you're forking out. At this price point, there are other choices you can take your pick from but there's a possibility you'll be driving away with one that isn't as upmarket, well-equipped and comfortable as the A3 Sedan. With an engine this minute, yes, it's hard to imagine how well this car can fare on our expressways, especially when overtaking manoeuvres are constantly required, but it'll be even harder to imagine paying an annual road tax of just $400. But with this A3 Sedan, you certainly can. 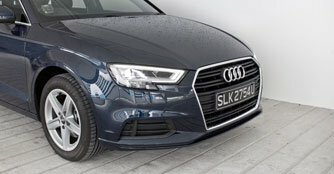 An extra boot and a 'tailored' sheet metal mark the Audi A3 sedan as a desirable and good-looking addition to the A3 lineup. New Audi A3 Sedan - "only premium petrol sedan under Cat A"